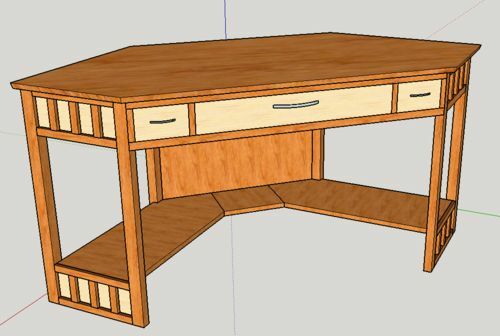 This is a picture of a desk I designed in Google Sketchup. I have a few questions about the design, as I’m still a relatively new woodworker. I want the top to be made out of solid oak, not plywood, because I want it strong, heavy, and sturdy. The two posts that are on the two side legs are 3/4” X 1”, and the back two are 1 1/2” X 1 1/2”. The top of the table from one corner to the other (Right in the middle of the top) is 64”. Do you guys think that the two sides and the two back posts will be enough to support the top of the table? I want everything to be made out of oak, and the lighter colored drawer fronts and the back of the two legs will be made out of brown maple. The desk is designed to go in the corner. I don’t think you will have a problem holding up the top with your design however I would strongly recommend ply wood for the top. Plywood is not only stronger than wood it’s more stable over time. One of the first pieces I made out of solid oak, a end table with all sides solid oak it was beautiful. Six months later it split down both sides and the top warped. You can always add an edge detail with solid oak and build it down to make it look more substantial for the top. If you leave provisions for the top to move, you shouldn’t have an issue with a solid top. I’m using a solid oak top that I first built about 15 years ago. It is 1X29X81” and is currently sitting on 2 file cabinets about 49”apart. Starting to show some signs of wear from my arms on the edge, but otherwise, its just the way I made it. 3 rules in gluing up a wood slab orientation, orientation and orientation. Do you guys think that the two sides and the two back posts will be enough to support the top of the table? Assuming proper joinery techniques are used to build….yes. Aesthetically though(and just my opinion you didn’t ask for), the 4 front legs look too thin/skinny in relation to the size of the desk. I think the two front legs are too spindly and would not be very sturdy at 3/4 X 1 inch.. I also think larger legs would be more aesthetically pleasing. I agree with just about everyone else. Front legs could be a little beefier. The top, plywood versus real wood is a no contest, real wood. In the past 25 years I have built at least a thousand all wood tops mostly for tables and not one has ever been brought back with the he problems listed in the other response. Dry wood, properly milled, joined, finished and fastened will last longer than any of us. I suspect the as-specified legs are strong enough to support the upper desk assembly. However your question suggests that you are unsure. Therefore satisfying your inner voice by re-designing the legs is worth considering. The posts could be made larger or a pair of smaller posts at each corner on the end assemblies to replace the single posts could bear more weight. I have some concerns with the design and choice of material for the lower shelf. The first concern would be addressed by ensuring the desk chair can fit under the desk without the chair legs bumping into the lower shelf. The second concern is wood movement of the solid oak lower shelf. The lower angled shelves could expand across the width of the panel. The geometry suggests that as the angled lower shelf expands, its expansion could be impeded at the front (chair side) by the rectangular center panel and at the back by the vertical post. Allowing for this movement would be tricky. If the lower shelf is made of edge-banded plywood, this movement would be of much less concern. If the lower shelves are made from solid oak, the front (chair side) 2” – 3” of the angled and rectangular shelves joint could be glued and the remaining length of the joint unglued. The back posts could then be moved to support the rectangular lower shelf section (rather than the angled lower shelf) so that the back of the angled lower shelf could expand to the rear of the desk past the back post. The only elegant joint I can think of in this application would be a sliding dovetail joint. Milling the end of the long angled shelf would be difficult. Whichever lower shelf construction method that is selected, providing some support to the lower shelf (perhaps short posts from the underside of the shelf to the floor) would reduce stress on the joints of the lower shelf. I foresee the lower shelf acting as a foot rest. If so, over time the joints could fail. Lastly, the long straight bottom rails on the end leg assemblies could allow the desk to rock on an uneven floor. ¼” thick pads glued under each leg would elevate the straight bottom rails off the floor and prevent the desk from rocking. with a real wood insert along the edges would make for a better product. strips on top with the real wood edges and it will look awesome. and if you do decide to go with actual dimensional lumber, you need to adhere to Pontic’s suggestion. wood slab = orientation, orientation and orientation (ask him if you are not sure what it means). Sorry, I guess I should’ve clarified a few things. The bottom shelves are going to be made out of oak plywood. I think it’s 1/2” in the plans, but it might be 3/4”. I think you guys are definitely right about supporting that. I never thought about using it as a footrest, but it might be one of those things I just naturally do after it’s assembled. As for the side posts, I absolutely agree that they should be beefier. 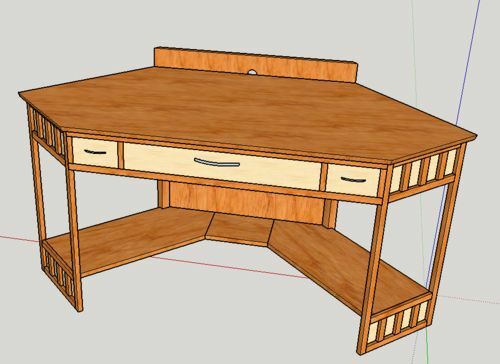 The original desk I designed was a lot smaller and they looked fine, but I decided to scrap it and remake the desk larger so the middle drawer would be larger. It was originally 15”, but I decided to make it a flip down drawer front and slide out drawer so I can store my keyboard and mouse, and my laptop when it’s not in use. It’s now 25”. I just copied over the design of the side posts to the new design because I didn’t feel like remaking them. As for the top, the angle from one end to the other is 64”, so my thought was to cut a board to 64”, joint one edge on the jointer, square up the other end on the table saw to 6”, and cut off the edges at 45 degrees on the miter saw. Then, cut another board to whatever the length of the short board is plus around an inch or so, then line it up and use a doweling jig to line them up. Then I can measure where I need to cut, take the board off, cut it, then put it back on. I would use biscuits, but I don’t have a Domino, and they’re not cheap. It’s really subtle, but there’s also a 22.5 degree angle on the outside. This is really just for aesthetics. I’ll attach more pictures after lunch. Any ideas on what to use to finish it? I was thinking shellac, but apparently whiskey will ruin it. I don’t like polyurethane. Maybe I didn’t apply it right, but every time I’ve used it I never get good results, even when I wet sanded. Maybe lacquer? Any ideas on what to use to finish it? I was thinking shellac, but apparently whiskey will ruin it. It will mess up the finish if you leave a spill but shellac is super easy to fix. Still, I would recommend coasters. You might like the newer waterbase polyurethanes which dry faster and don’t stink to high heaven like they used to. Lacquer and shellac are easier IMO but poly is more durable for a desk. Sand between coats so each one goes down on a smooth surface. The final coat should be light and buffed afterward to a smooth finish.